Following 2008’s sell-out exhibition, Proud Camden presents Withnail & Me: The Finale. 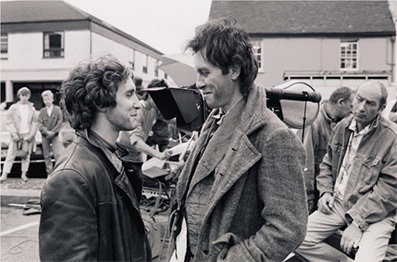 Taken by photographer Murray Close, from Camden to Cumbria, this collection of iconic shots and selected unseen prints make up a true celebration of the 60s cult classic Withnail & I. In Bruce Robinson’s devilishly quotable and quaffable classic, unemployed actors Withnail and Marwood (Richard E Grant and Paul McGann) decide to leave their squalid Camden flat for an idyllic holiday in the countryside, courtesy of Withnail's uncle Monty's country cottage. However, their plans for a period of relaxation and indulgence are thwarted, by their inability to cope with ghastly weather, frosty locals and the advances of Monty himself. First call for the world’s most influential film makers and directors, Murray Close was invited to shoot the cast and crew during filming in 1986. The resulting images are a joyous and revealing collection; single shots astutely summarising the weight and comedy of popular skits, and familiar characters caught off camera between scenes. Revisit the pair’s fateful trip to the Penrith tea rooms, Uncle Monty’s sermon on "flora or fauna" and Withnail’s dramatic culinary attempts in the woods with little more than a pair of underpants and a rifle. Over twenty five years since Withnail & I first graced our cinema screens and following the sad passing of actor Richard Griffiths (Withnail’s infamous Uncle Monty), Proud Camden pays tribute to the script, the actors and the photographer behind one of the most iconic films of the 20th century. Internationally renowned photographer Murray Close began his film career working on Stanley Kubrick's The Shining. With this introduction he quickly made a name for himself and went on to be first call for the world's most influential film-makers, creating some of cinema's most iconic images on films such as Mission: Impossible, Indiana Jones, three Harry Potter films, Jurassic Park, Batman, several Clint Eastwood movies, a number of Clive Barker horror movies, Hope and Glory and Withnail and I. During the mid-1970s he expanded his photographic skills to capture some of the great names from the emerging music scene whilst continuing to forge strong links with the film community. Being Spielberg and Eastwood's photographer in Europe it was clear that new frontiers had to be conquered and he moved from England to Los Angeles in 1991. It was here that he set up his studio and fine tuned his love of portraiture. In 2001 Close felt it was time to up root again and this time he set up his studio in Prague, a city he first visited in 1983. In Prague he also designed and established a film laboratory specializing in providing services to movies shooting on location in central Europe. An approach from Warner Bros gave him the opportunity to shoot 3 Harry Potter movies and it was in this period that he set up a complete digital 'in house' facility for Harry Potter and The Goblet Of Fire. He was quick to embrace the new world of digital photography but is quick to add that he often returns to one of his great camera love affairs, the Fuji 680 and the Hasselblad Xpan, both firmly rooted in 'the old school' ways. In 2007 he was asked by the Camerimage Film festival in Poland to shoot portraits of the visiting Cinematographers and returned to London to open his acclaimed exhibition of seldom seen art from Withnail and I celebrating the film's 20th Anniversary at London's BFI in conjunction with a Radio 4 documentary, The Reunion. The exhibition – Withnail & Me: The Finale Photographs by Murray Close – opens on Wednesday 20th June 2013 at The Horse Hospital, Stables Market, Chalk Farm Road, London NW1 8AH and runs until 1st September. Doors open daily between 11am and 5pm and entry is free. You can find more about Proud Galleries at www.proud.co.uk.